Shaws of Darwen have launched three new models, expanding their Classic Collection and Inset/Undermount offerings. Each new hand-crafted sink carries the Shaws of Darwen logo, which is a guarantee of traditional quality in a modern product. Sinks are manufactured with a 3½” waste outlet which is suitable for basket strainer or waste disposer. The Classic Collection is a wide range of sinks designed to appeal to more contemporary styles, yet true to the heritage of handcrafted fireclay. The Classic Collection has stylish slim side walls for a contemporary appearance with no compromise to construction quality. The Brindle 800 is a larger version of Shaws existing 1.5 bowl ceramic sink. 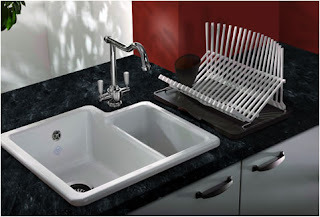 A very practical, stylish sink with a true half bowl of full depth. This new model can be inset or undermounted with granite, wood or quartz worktops and extends our Inset/Undermount range to seven shaped models. The Classic Butler 900 is a large, deep Victorian style sink which can take large pots, pans and racks which are too large for the dishwasher. The sink features a round overflow on the side wall and extends the Shaws Butler family to five models which includes the popular 600, 800 and 1000 sizes alongside the new Classic Whitehall. The new Classic Whitehall is a deep, generous sink which has been created specifically for customers who want a fireclay farmhouse sink with a laminate worktop. The clever design gives a Classic Butler sink appearance from the front and protects the cut edges of the laminate from water by using a subtle lip on all exposed sides. The Whitehall can be installing using standard Belfast sink base cabinets, therefore, no bespoke cabinetry is required, making for a lower cost installation. All of the new sinks are handcrafted in white and biscuit finishes with a durable glaze designed for years of usage and all carry a comprehensive guarantee. Visit www.shawsofdarwen.com to view the complete range.